More than 1,000 silver coins buried on the "front line" during the English Civil War have been discovered in a farmer's field in Lincolnshire. 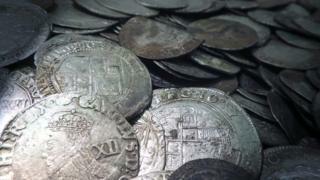 The hoard of 17th Century coins was found by metal detector user Steven Ingram near the village of Ewerby. Council finds officer Adam Daubney said the discovery was "monumental". Farmer Chris Sardeson, who owns the land, said: "I've worked this field for more than 50 years, so no-one is more surprised than me." Fragments of the pot in which the coins were originally contained were found nearby. The first of the coins was unearthed on 3 October, with further coins found over the following few days. Dr Daubney, finds officer for the Portable Antiquities Scheme at Lincolnshire County Council, said: "This is the largest of the hoards that has been found from that time in the county, and it contains coins from the reigns of Edward VI, Elizabeth, Mary, James I and Charles I. "The area between Grantham and Boston was a zone of intense conflict between the Parliamentarians and the Royalists in the early years of the war, so we can think of the Ewerby hoard as being from the 'front line'. "The hoard tells us about the uncertainty and fear that must have been felt at the time, but quite why it was buried - and by whom - is impossible to say. "It might have been buried by someone who went off to fight and never returned. Interestingly, several of the estates that lay close to the site of the hoard were fined after the war for supporting the king." The hoard is being processed under the Treasure Act, and a report on the coins is currently being prepared for the coroner.